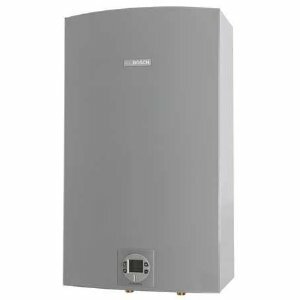 A review of Takagi water heaters; Takagi T-H3, T-H3J, T-H3S and T-H3M with the tankless and condensing technology, for small and large homes. Check out the advanced features with benefits, differences between the models, main specs, comparison and what one homeowner should know in order to buy the best model. 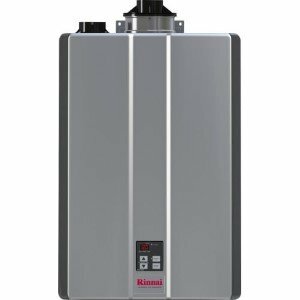 Designed small but powerful, Takagi T-H3 tankless heaters are ideal for whole-house water heating, on demand and in a continuous supply of hot water in residential and commercial applications. And not only for potable water heating but for space heating and recirculation (but only some models). One of the greatest features found on Takagi T-H3 water heaters is the innovative condensing technology. Condensing technology utilizes not one, but two heat exchangers (HE) where the secondary HE is made of the high-quality stainless steel to ensure corrosion-free operation in the acidic and low-temperature environment. The primary heat exchanger is made of the high quality HRS35 copper alloy that ensures durable and reliable water heating. Such a strong material provides excellent resistance to the thermal and mechanical stress that occurs at the high temperatures. 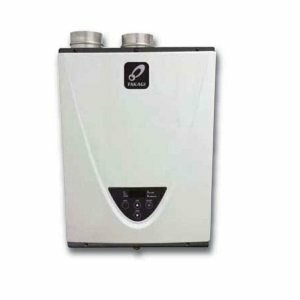 Such an advanced design provides high energy efficiency with the energy factor of over 0.90 that complies with the ultra-low NOx standards making such a tankless water heater green, environment-friendly and ideal for regions with the strict emission law. Condensing models are the most advanced units on the market, expensive to buy but saving big on energy. Another great benefit is that every indoor tankless water heater from Takagi has a built-in temperature controller while the outdoor units include the wall-mount remote controller in the purchase, with the advanced electronics for easy troubleshooting. The controllers utilize the functions such as; info button to display the water flow, inlet and outlet hot water temperature in F and C, status indicator, error display, and push buttons, making it very convenient to use. There are several models found in this H3 group: T-H3, T-H3J, T-H3S, and T-H3M series. Takagi T-H3M-DV, as an indoor and T-H3M-OS as an outdoor model, are the smallest models that come with only 120,000 BTU gas power, the maximum water flow of 6.6 GPM and energy efficiency of 0.93, making them ideal for 2-3 bath homes or apartments. The lightweight design of 44 lbs allows easy handling and installation almost anywhere, and especially at the point-of-use application. Takagi T-H3J-DV and T-H3J-OS, with the maximum power of 160,000 BTU and EF of 0.95; and Takagi T-H3S-DV and T-H3S-OS with the 180,000 BTU gas power and EF or 0.95, are stronger models than the previous T-H3M models and are suitable for larges homes, with up to 4 bath homes. Takagi T-H3-DV and T-H3-OS are the largest and most versatile models that are designed with the high 10 GPM water flow and strong 199,000 BTU Eco-friendly gas burner, which makes them recommended for large homes with up to 4.5 showers, commercial applications such as restaurants, also space heating and recirculation systems. When comparing the above T-H3 to the T-H3J, T-H3S and T-H3M models, the main differences are the higher power and water flow of T-H3 models, also its the ability to use the Easy-Link and Multi-Link systems and connect up to 4 or up to 20 units for very demanding applications - where the maximum gas input can reach high 796,000 BTUs . These are the reasons why you should consider buying the Takagi T-H3 model - the strongest model offering the highest savings. The temperature of hot water is easy to control either by using the temperature controller or dipswitch, using one of 17 settings to adjust the temperature between 100 F and 160 F, or 9 settings found in other models and set the temperature up to the maximum of 140 F.
Takagi T-H3 is not only built for residential water heating but for commercial applications also, featuring the bypass and flow adjustment valve for the optimal control and precision in high-volume conditions. T-H3 is the only model that is NSF Certified Food Equipment approved. All these features and advantages over other brands and even other Takagi models makes Takagi T-H3 model a good candidate for purchase. Heat exchangers made of commercial grade HRS35 copper alloy and stainless steel are designed to increase durability and reliability. The manufacturer provides 15-year warranty in residential applications and 10 years on the commercial. A heat exchanger made of the commercial grade copper alloy - HRS35 is found only on a Takagi H3 model, while other models use the standard copper C1220. Bypass and flow adjustment valve for optimal temperature control and precision. Flexible venting with indoor and outdoor installation options. Air supply pipe can be made of ABS, PVC, CPVC, PP or steel. The direct venting can use horizontal side or vertical through the roof termination. Also, based on the personal preference and installation options, you can choose between the single pipe system with the room air intake and two pipe system with the air intake from the outside. Direct vent system requires 3" or 4" PVC venting pipes with a maximum length of 100 ft and with zero clearance to combustibles. Takagi T-H3 models are designed for heating not only potable water but space heating and use in recirculation systems. Temperature remote controller is built-in in every indoor model and provided with every outdoor unit. Built-in AFR sensor (air-fuel mixture ratio) provides the proper gas combustion which results in increased efficiency and low emission. Easy-Link system for connecting up to 4 units on T-H3 models. Multi-unit system connects up to 20 units on T-H3 models. Freeze protection system ensures that water temperatures inside the heat exchanger never falls below a certain temperature. Hi-limit switch ensures safe temperature levels of hot water. Overheat cutoff fuse protects the unit by shutting it down if the temperature of heat exchanger increases above the safe level. Takagi manufacturer provides a long warranty of 15 years on the heat exchanger if used in residential applications, 10 years in commercial, and 5 for other elements.